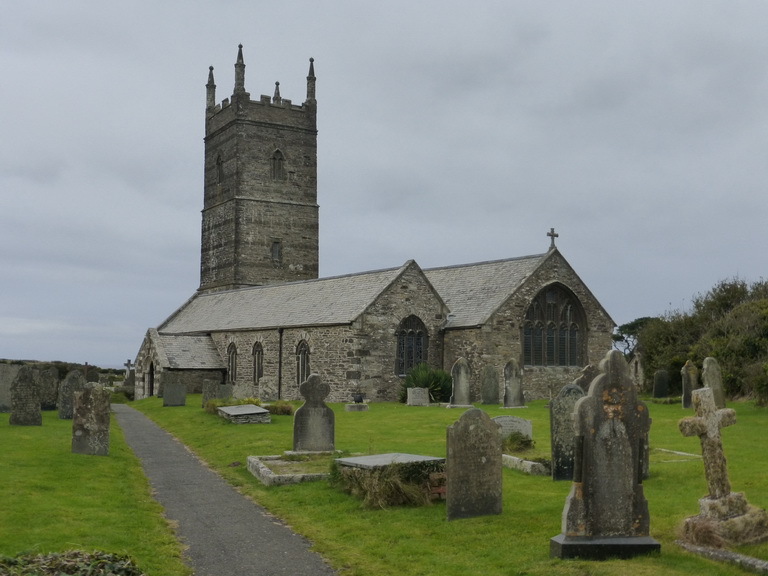 St Eval now stands alone on a large flat open space, surrounded by the masts of a listening post. The former airfield whose dispersal points ran right up to the church, is now gone. The presence of the RAF is strong throughout the church which was adopted as the garrison church and the churchyard contains some touching memorials to young flyers from WWII. The tower, with its elegant banding of different stones, is tall and was once re-built with money from Bristol merchants keen to ensure that it was a landmark for their returning ships. The interior is well-kept and bright with most of the RAF memorabilia restricted to the south aisle. Restored by JD Sedding in 1889, there has been a sensitive re-use of original material, notably in the good but not outstanding bench-ends and backs; in the C17 octagonal pulpit; in the wagon roofs and in the remnants of the original rood screens which survive up to waist height. 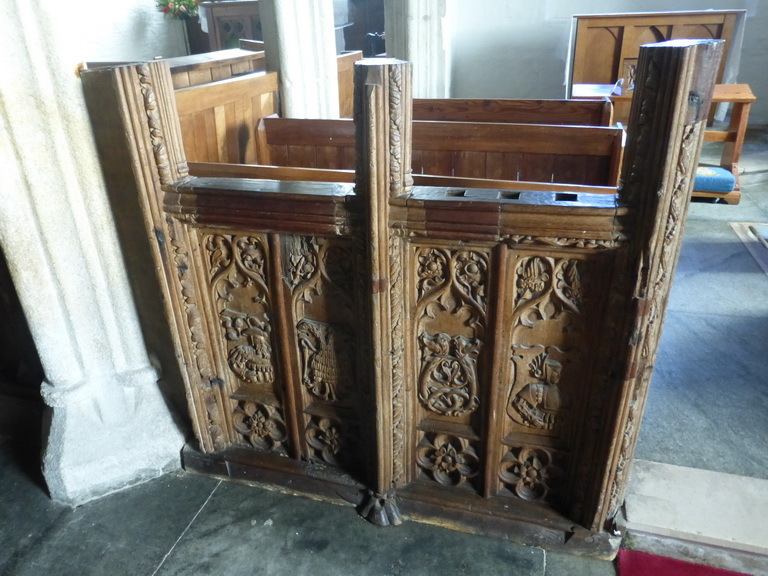 As in many other churches, the rood screen has a series of short uprights to indicate where the shafting once went. This is slightly mannered but probably solves the problem of how to finish the tops of the remaining pieces. There are some charming bits of carving on the screen and bench-ends, including a dragon eating a bone, a couple of what look like wyverns and, on the usual symbols of the Passion. The font is a plain Norman affair, elegant in its simplicity, and there are some good slate memorials including one C18 one to William Trevithick which suffers from the usual typographic difficulties of an unprepared carver whose spelling wanders. Farewell, kind friends / Farewell Dear Wife and Brother / Peace be your Ends / United to Each Other. There are also a couple of architectural curiosities. The arcading between the north transept and nave includes what is effectively a massive squint – now used by the organist who can thus hide form the congregation – while that between the south chancel and nave reduces in height beneath the position of the original rood. It is the RAF memorials that catch the eye in the south aisle: flags, squadron shields, font cover and a bright window in bold modern colours. 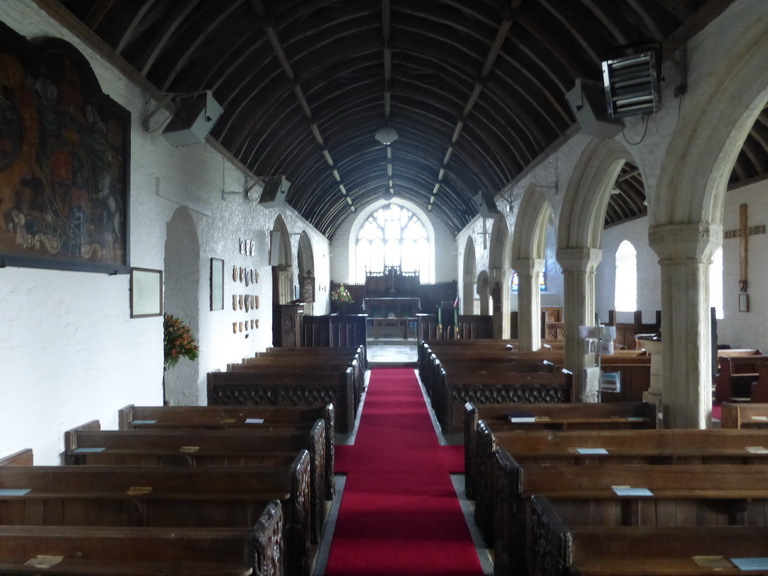 This is a church which is clearly cared for and, having been adopted by the RAF, is still in use by them.